Despite its ancient roots as the crossroads of Africa, the Middle East and Asia, the modern Republic of Yemen is a relatively new state.It was created after communist South Yemen and traditional North Yemen merged in 1990, following years of strife. The Yemeni Civil War is an ongoing conflict that began in 2015 between two factions claiming to constitute the Yemeni government, along with their supporters and allies. Houthi forces controlling the capital Sana’a and allied with forces loyal to the former president Ali Abdullah Saleh have clashed with forces loyal to the government of Abdrabbuh Mansur Hadi, based in Aden. Al-Qaeda in the Arabian Peninsula (AQAP) and the Islamic State of Iraq and the Levant have also carried out attacks, with AQAP controlling swathes of territory in the hinterlands, and along stretches of the coast. The Saudi-coalition warplanes planes usually target civilians and vital infrastructure. Yemen’s Popular Forces (which includes Ansarullah and the Republican Guard among other factions) on the other hand, only attack military targets. Yemen is one of the poorest countries in the Arab world. Yet they remain steadfast in their resistance against Saudi Arabia: one of the wealthiest and best-armed countries in the region. Despite an intense bombing campaign from the Saudi aggression, Yemen’s Popular Forces had an impressive July hitting several high value military targets and demonstrating advanced homegrown missile capabilities. Yemen’s popular forces have long been working on developing their own long-range ballistic missiles called the Borkan H-2 aka “Volcano H-2” which has a range of nearly 900 miles. According to military experts, Yemen has a large arsenal of surface-to-surface missiles, various old Soviet missiles, most notably the Scud missiles that Yemen obtained during the Cold War from the Soviet Union, which supported the People’s Democratic Republic of Yemen and supplied them with weapons, Tactical rocket. The Yemeni Sniper Unit carries out a special operation beyond the Saudi border in the provinces of Jizan, Najran, and Asir. All of these areas were previously a part of Yemen at one point so Yemen’s resistance has expanded their ground operation in these provinces in retaliation for the ongoing Saudi air campaign and aggression. The Yemeni Sniper Unit recorded 26 confirmed kills last month. Bringing their total for the year to nearly 330. Yemeni ground forces report the deaths of 117 Saudi mercenaries on various other fronts for July. Saudi Arabia’s Air defence forces downed the missile over the Wasaliyah area of Taif province, 69 km from Mecca, without causing any damage, the coalition said in a statement carried by Saudi state news agency SPA end of July. In over 850 days of war against Yemen, the Saudi-led air raids have destroyed everything needed to sustain life. Targets include homes, schools, farms, shipyards, and much more. The numbers of civilian lives lost is astronomical. The aggression has internally displaced thousands fleeing airstrikes or chaos. A blockade cripples Yemen financially and deprives citizens of basic goods most people would consider human rights; like food, water, and medicine. Just at the end of last month, the Saudi coalition prohibited 4 oil tankers from entering the Hodeidah port. Yemen’s water pumps need fuel to run. So depriving Yemen of fuel is depriving Yemen of clean water. This is an absolute necessity since the Saudi aggression against Yemen has triggered a globally unprecedented cholera outbreak. Experts estimate that over 400,000 will be infected by the end of 2017. About 2,000 people have already died from the preventable disease. Not only has the Saudi-led war directly caused this outbreak, but they’re further exploiting it to beat Yemen into submission. 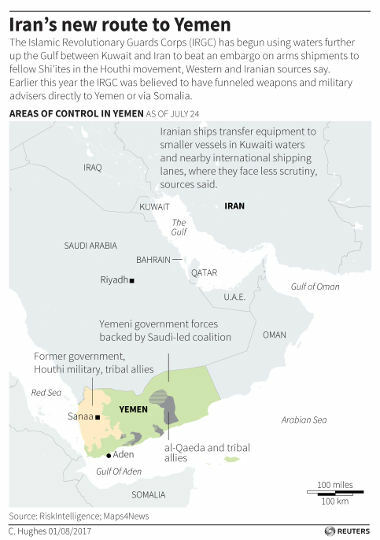 Iran’s Revolutionary Guards have started using a new route across the Gulf to funnel covert arms shipments to their Houthi allies in Yemen’s civil war, sources familiar with the matter have told Reuters. Washington Post reports that a contingent of U.S. troops is involved in a Yemeni operation to push al-Qaeda militants from one of their key strongholds in central Yemen, the Pentagon said Friday. Since Feb. 28, the United States has conducted roughly 80 airstrikes against al-Qaeda militants in Yemen Pentagon added to this statement. .The announcement comes a day after the United Arab Emirates said in a statement that its forces, along with U.S. troops, were supporting the Yemeni military in the Shabwa governorate in a bid to oust al-Qaeda fighters entrenched there. As revealed by an Associated Press (AP) report published last week, the US and UAE have established a network of at least 18 secret prisons in Yemen used for torturing and interrogating men who are suspected of having ties to Al Qaeda in the Arabian Peninsula.Since Trump took office earlier this year, US Special Forces have increased their activity on the ground in Yemen, carrying out raids and providing support to the UAE and its various proxy militias. Moreover, this whole (cholera) crisis has been created by the activities and the war that has been unleashed by the Saudis and its allies which includes the United States, Britain and the West, and they are systematically attacking civilians, they have destroyed all infrastructure,” Massoud Shadjareh, head of the Islamic Human Rights Commission, told Press TV in an interview on Friday. Donald Trump, Saudi Arabia and “friends”: Arms, Money and Rock & Roll. For two years, Saudi Arabia and a coalition of its allies have been involved in a conflict in the neighboring state of Yemen. Dubbed the forgotten war by Amnesty International, the violence has been largely eclipsed by the much deadlier conflict in Syria. The Saudis have spent much of this time trying to solicit US help, something the Trump administration has been quietly increasing since January, according to Quartz. Much like Syria, the fate of Yemen is important for regional and global security. It is now a frontline in a proxy war between Iran, the Gulf Arabs, and the US, as well as a bastion for Al-Qaeda operatives planning attacks on the West. Regardless of their human rights abuses and their spread of Wahhabi terrorism, the Trump administration will seek closer ties with Saudi Arabia. The Trump Administration is expected to approve the new arms deal to Saudi Arabia to continue its bombardment of Yemen. Yemen’s slow dissent into civil war began in 2011, as the Middle East was engulfed by revolution. After Yemen’s longstanding authoritarian leader Ali Abdullah Saleh was forced to step down in 2012, the internationally mediated political transition faltered and eventually collapsed. But it wasn’t until a rebel group known as the Houthis, in alliance with the disgruntled Saleh and his supporters, made sweeping military gains in 2014 that Saudi Arabia itself felt threatened. Last October, the Saudi Arabia-led coalition bombed a funeral hall in Yemen’s capital, Sanaa, killing and wounding hundreds of people. Soon after that unlawful bombing, the Obama administration suspended the sale of nearly $400 million in weapons to Saudi Arabia. It was a recognition, a long time in coming, that the coalition’s military campaign in Yemen had devastated the country, killed thousands of civilians and brought it to the brink of famine. While in Riyadh this weekend, Trump reportedly plans to announce more than $100 billion in arms deals to Saudi Arabia — nearly as much as President Obama authorized during his eight years in office. The deals include Raytheon bombs, Lockheed Martin missile defense systems and BAE combat vehicles, and some of the weapons whose sales had been suspended. The scars of unlawful airstrikes can be found across Yemen, where the Saudi-led coalition has carried out scores of attacks that hit homes, schools, markets, and hospitals since March 2015, when it began its military campaign against the Houthi armed group and forces loyal to the former longtime president Ali Abdullah Saleh. Human Rights Watch has documented 81 apparently unlawful coalition attacks over the last two years, many possible war crimes. In almost two dozen of these cases, including the attack on the funeral hall, we were able to identify the US weapons that were used. According to the United Nations, at least 4,773 civilians have been killed and 8,272 wounded since this conflict began, the majority by coalition airstrikes. The war has driven Yemen, already the poorest nation in the Middle East, toward humanitarian catastrophe. Trump is doing what every administration has done in the past whether Democrat or Republican and that is to support Iran’s long-time adversaries, Saudi Arabia and Israel and isolate Iran that will allow the U.S. to dominate the resource-rich region. The U.S. and its allies have been preparing for a possible war against Iran since the 1979 Iranian revolution that overthrew the U.S. puppet government of Mohammad Reza Pahlavi also known as the Shah of Iran. However, a war scenario is unlikely to play out any time soon since it would lead to a wider war in the Middle East with the Axis of Resistance including Russia and China, a costly war one might add. Trump will build a closer relationship with Saudi Arabia despite the fact that is committing war crimes against Yemen and has supported terrorist organizations committed to overthrowing the Syrian government. Trump has repeatedly claimed that he wants to defeat the Islamic State, but Saudi Arabia is not a good partner to take on the terrorists because historically speaking, they have armed and supported terrorist organizations for a long time. Washington and Saudi Arabia is a strategic alliance. Besides, Washington does like a good dictatorship that follows its marching orders, after all, the Saudis do have an abundance of oil that feeds the Military-Industrial Complex and provides enormous profits for U.S. oil companies. The Saudis long-time support of terrorism also advances Washington’s agenda to create wars and regime change in the Middle East. Washington has a vested interest in Saudi Arabia and that is why Trump will keep the alliance between the U.S. and Saudi Arabia intact, a move that advances Washington’s agenda and that is something that the establishment (or the swamp) would not disagree with.